A missing person, a murder, a touch of Southern gothic. Two stone-faced men driving through a desolate countryside. A narrative jumping from decade to decade, following the detective’s voice as he slowly, so slowly, spills the tale to us, and to the men in the deposition room who already know it. Long overhead shots of roads, always roads. True Detective is back. "The Great War And Modern Memory"/"Kiss Tomorrow Goodbye"
Debuting five years (almost to the day) after the series premiere—and three and a half years since the season-two finale—True Detective’s third season starts in in November of 1980 in West Finger, Arkansas, where 12-year old Will and 10-year-old Julie Purcell (Phoenix Elkin and Lena McCarthy) have gone missing. And in 1990, when former police detective Wayne Hays (Mahershala Ali) is deposed on the children’s disappearance, and learns of new evidence. And in 2015, if Wayne Hays is to be trusted with dates, when despite his failing memory, a documentarian interviews him about the Purcell case. A show as distinctive as this is easy to parody; and easily falls into self-parody. Time is a flat circle, and so on. For True Detective, which leaps from decade to decade in a flash, a flashback within a flashback is business as usual, or would be. And, as Erik Adams points out in his overview of this season, in the years since True Detective’s dormancy, viewers have grown accustomed to ever-greater intersections in television narratives. But in its third season, writer/creator Nic Pizzolatto is stretching to make even more out of True Detective’s multiple timelines, intersecting narration, and unlikely overlaps. In its third season, time really is a circle, at least for Wayne Hays. So when “The Great War And Modern Memory” opens on a flashback, then eases into another, it’s not the frantic flailing of a writer frantic to cram in exposition at the cost of clarity. It’s an attempt to convey something of the confounding experience of living, like Vonnegut’s Billy Pilgrim, unstuck in time. It’s a tricky gambit, and one that doesn’t fully land in the moment. But as the two-episode premiere inches on, the muddled, multi-layered opening seems more and more fitting. “Inching on” is exactly what “The Great War And Modern Memory” does, following Will and Julie as they ride away from Shoepick Lane, biking into the west. On each road, each corner, someone sees them, and the children see them back. A neighbor taking in Halloween decorations. A classmate waving from a yard. A trio of surly teens as grubby and vaguely threatening as any of Stephen King’s small-town hoodlums. With excruciating patience, the children are shown riding into what we know must be nothingness. That slow burn is essential. If it doesn’t pay off, “slow burn” is (as Hays’ partner ribs him while they sit shooting junkyard rats) “another way of saying you’re slow on the draw.” If it does, that meditative patience is just one more element distinguishing True Detective from a standard procedural, drawing focus from the investigation to the investigator. 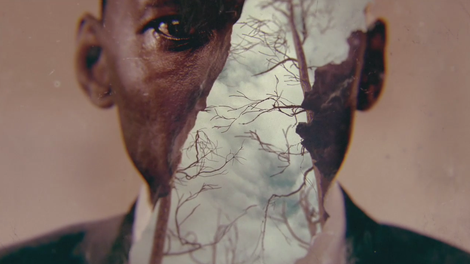 True Detective has never been about the crime, or about the human monsters committing them. It’s about the detectives who hunt those monsters, and whether and why they may grow into monsters, too. That’s demonstrated in the closing of episode one, as Det. Hays strikes off on his own to track the missing children. As he walks (and sometimes climbs) through the rough terrain, as he ascends the crude steps of the watchtower, the score clangs and jangles behind him like nerves, or like hard footsteps banging upstairs. Every time Hays turns a corner or sees a new vista, he’s braced for the horror of discovery, and so are we. It’s exhausting, and that’s the point: a bubble of dread rising, then popping into nothing, over and over, until he finds the worst. Eventually, his dread is not the grisly fear of finding a child’s corpse, but an existential dread greater still. Wayne Hays has what he describes in a daily recording to himself as “memory problems,” problems his colleagues know about as early as 1990. But Wayne Hays has more than memory problems. Wayne Hays has time problems. It isn’t just Wayne’s memory that’s slipping out of his control. It’s his sense of time. Standing in the Purcell’s front yard on Shoepick Lane, Wayne is called out of the moment, and out of his time, by a voice from the future, and 2015 crashes in on 1980, as jarring as a wall crashing down. Reality breaks again when Hays, kneeling to inspect a footprint in mud by the light of the moon, sees that moon blink out of existence, and he’s yanked into 2015 again, when the film crew’s light has blown out. It’s unsettling. It’s audacious. It mimics the fluidity of memory, and the chilling uncertainty of a mind lost in time. When these breaks occur—when Wayne Hays gets unstuck in time—Mahershala Ali breaks his character’s calm with devastating silent dread. Ali does a lot with silence here, more than he should have to. The characters are sketched out, not fleshed out. But sometimes, that emptiness is effective. In his first meeting with Amelia (then Miss Reardon, a West Finger English teacher), Det. Hays asks, with quiet significance, “How is it here? You know.” She knows. “I hear something now and then,” she tells him, but mostly “it” is fine. In many spots, these episodes are underwritten, but here the spareness of the dialogue—his “you know,” and her answering “you know”—allows these characters, and these actors, to communicate as people often do about a shared fact of life: indirectly, knowingly. It sure looks like people listen to Hays. In every investigative scene, Ali projects an air of thoughtful but clear command, an assurance that is both comforting and compelling. That’s how it looks. And in the strategy session, West follows the PA to the door, pitching reasons to withhold the evidence, then a final plea to salve the politician’s real fears: “They’ll get over it.” It looks like people listen to Hays. It looks like his partner went to bat for their strategy. But looks deceive. In True Detective, everything deceives. During the search for the Purcell kids, a uniformed cop scoffs at Hays’ lone-wolf technique until West sets the younger cop straight. In Vietnam, Wayne Hays was a scout for a long-range reconnaissance patrol, an elite tracker who walked the jungle and brought soldiers back. In 1980, he tracks boar on foot, hunts deer only with a bow, and walks the periphery of a possible crime scene, scouting out the crucial details that others miss. But his expertise doesn’t protect him from a rookie’s assumptions, or from his superiors’ indifference to his advice. Previous incarnations of True Detective have split focus, narratively and visually, between teams. But in the two-part season premiere, director Jeremy Saulnier wisely keeps the camera on Ali, even when the focus isn’t. The camera wants to stay on him, and so does the viewer’s eye. Whatever else happens in he frame, it can’t compete with the subtle, concise layers of emotion and intelligence radiating from Wayne Hays, and from Mahershala Ali. That’s not to slight any of the cast. Det. West isn’t holding half the weight of this show, and neither is Dorff. He doesn’t have to; he’s here to be the swaggering distraction, the companion and colleague but not the co-star. In his yoked blazers with double vents, wide ties worn loose and rumpled), he looks raffish and almost seedy, like Matt Damon playing Jim Rockford . (We know from conversation after the deposition that by 1990, Roland has “done well for himself,” but not how.) Roland West is Wayne Hays’ partner, but Stephen Dorff is undeniably a supporting actor. If any cast can make this assortment of types—the working dad in his beat-up baseball cap, the frazzled mom (Mamie Gummer) who doesn’t even sneak around anymore, the maverick sidekick, the smooth politicos who care more about elections than investigations—this one can. Along with the performances, attention to costume helps these clichéd characters feel alive and lived in: “Trashman” Woodard’s checked wool jacket, with grubby edges around pockets and cuffs; West’s rumpled blazers, like Jim Rockford as played by Matt Damon; Amelia’s eye-catching but practical winter coat. It’s not showy; it’s concrete. It feels real. Hays looks even more imposing next to his rumpled partner, crisp and unflappable. But as Hays himself says in the first minutes, “the general rule is everybody’s lying, period.” No one and nothing here is telling the whole truth, and not just because, as his hostile former colleague pontificates, we cannot know what we do not know. Wayne Hays doesn’t keep his tie tight because he’s unflappable, but because his tie cannot be loosened. It’s a clip-on, one he wears because he’s “preoccupied” by the thought of being strangled by his necktie. True Detective lies to us. That’s its nature. Wayne Hays, this pillar of cool but compassionate efficiency, was called in with his partner from a night of knocking back beers and shooting rats; he showed up with chewing gum in his mouth to mask the smell of his misconduct. He’s a man sought for his memories in two timelines, who is plagued by “memory problems.” He’s telling a story, and he has to remind himself what story he’s telling. Whether the details are more fogged by dementia or deceit, we can’t know yet. We also can’t know yet whether the narrative underlying all this somber pomp is worthy of the performances, the careful costuming, the note-perfect ever-shifting period settings. The pace is taut, unafraid of long pauses and tension that evaporates into nothing. The visuals are austere and forbidding: broad aerial shots of the Ozarks as autumn leans into a long winter, the matter-of-fact grime of everyday work. And Mahershala Ali’s performance lends the first two episodes a grace and gravity far beyond what it’s earned. Here’s hoping the remaining six prove the show, not just the actors, deserve it. Welcome to season three coverage of True Detective! While comparisons to previous season are inevitable, early on I’m giving this season a chance to stand or fall on its own strengths. Whatever happens, clearly its greatest strength is Mahershala Ali. The premiere shares its title with Paul Fussell’s The Great War And Modern Memory, in which he posits that a generation of artists grew more brutal in their aesthetics and approaches in the aftermath of WWI. 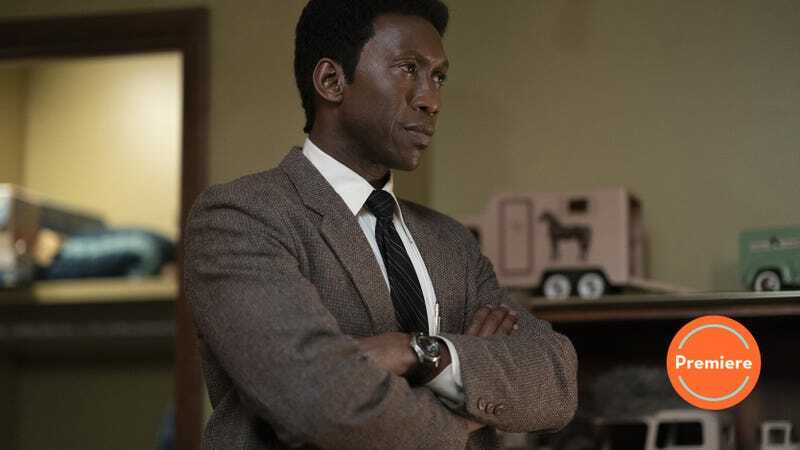 “There’s another one of them dolls further back, right where the trail got sketchy.” True Detective is always about the trail getting sketchy, and as often as not, the detectives are the ones disguising the path, clouding the questions. Those “straw dolls” appear to be cornhusk dolls. Either way, they’re one part Blair Witch Project, one part native arts, and, in close proximity to a child’s murder, 100% creepy. The Franklin scandal to which the Sarah Koenig-esque interviewer refers in 2015 was discredited as a hoax in 1990, because—again—True Detective is not about the crime. It’s about the cop. "Y'all know something I don't?"